Here at Beech we are commited to providing an exceptional service. We strive to access the best possible treatments for your pet, for example we use the new L4 vaccination against Weils disease covering two more strains than the old vaccine. We also stock a variety of preventative flea/tick and worm treatments so we can attend to a pets individual needs. Our Vets and Nurses keep up-to-date with all advances in medicine and are always happy to discuss matters over the phone. We have access to fantastic facilities and now have our very own in-house blood analysers. "The staff at Beech Vets are wonderful, in the past couple of years we made lots of visits and when we had to say goodbye to Holly our beautiful Chocolate Labrador they were so kind and compassionate. We would highly recommend them. Thank you Beech Vets." "I have recently had to say goodbye to my elderly Bassett the girls at Beech were amazing. They were sensitive kind caring and understanding.i have in all my years as a dog owner NEVER had a vet as good as these lot." "Brilliant staff, always smiling and helpful. My dog actually looks forward to going!" " Amazing! Totally would recommend! I've taken my animals to a vets in the town and was not impressed with how I/they were treated, however when I came to this Vets I have nothing but praise, staff always want to help and will spend time talking and explaining things to you, I feel totally calm leaving my pets in their care! 5 stars from me!" "Always helpfull friendly staf, best vets I've used." "Professional, polite and caring practice"
"I think our animals get better treatment than humans! An appointment half an hour after my call, an X-ray, treatment all sorted. Oh to be a dog! All the staff are brilliant." "Excellent ..; genuine, caring , kind and thoughtful, not just to the animal but to the owners to, rang me after my dogs op to let me know how he was l. I broke my foot and offered to collect my dog for me. Rang me the next day to see how Alfie was ... Can't recommend these vets enough." "Lucy and the whole team are absolutely lovely and the care Teddy has received here is second to none, and I always walk away feeling confident in the treatment plan. I would throughly recommend Beech Vets to anyone, they truly care for the pets they are treating as though they're their own and nothing is too much trouble. The communication is brilliant and I always leave feeling reassured that my baby is in good hands. Would not go anywhere else!" "Brilliant staff at beech vets. They have looked after my dog Lexie, who suffers with diabetes, really well with great care and attention. Thanks to there care after a really bad spell she is still with us and getting back to her old self." "Excellent vets . My bull terrier puppy enjoys his trips to the vets , the staff are very friendly and honest . Would highly recommend!" "Excellent vets and all the people who work there in various roles ,cant recommend them highly enough.x"
"Really recommend these guys, friendly, care about the animals they treat, and not out to sell you stuff you don't need! Best vets I've ever used! Thanks all!" "Amazing! Totally would recommend! I've taken my animals to a vets in the town and was not impressed with how I/they were treated, however when I came to this Vets I have nothing but praise, staff always want to help and will spend time talking and explaining things to you, I feel totally calm leaving my pets in their care! 5 stars from me!" "Brilliant Vets, made me feel happy and confident to leave my bunnies in the most capable hands. "I am so pleased and happy to have found this vet, so caring and professional, will be recommending to all my friends and family." "Thank you for getting our old lady back to her normal self again! We have been going to a different vets for the last 10 years but will definitely be going back to Willington when need to again. Very happy!" 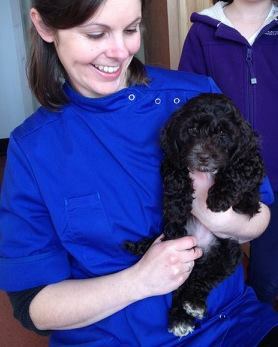 "Excellent treament very caring New vets"
"Lovely, caring, thoughtful, wonderful vet lucy so glad there in the village x"
"Very friendly and a pleasure to take Ruby to see her." "Excellent, professional and friendly service. Highly recommended. Many thanks to Lucy and Lisa for looking after Max!" "Excellent! Very professional, lovely people and very reasonable"